Covering almost 1,000 hectares, Richmond Park, located by the Thames in the city’s south-west, is the largest of the Royal Parks. We have talked about some of Richmond Park’s history in an earlier post, but here we’ll give a little more detail. The park’s association with royalty goes back at least to the time of Edward I, who ruled in the late 13th and early 14th century, when it was part of the Manor of Sheen. It was King Henry VIII who renamed the manor Richmond (after one he possessed in Yorkshire) but it was King Charles I to whom the park owes its existence as we know it. Charles, who had brought the court to Richmond in 1625 to escape the plague, enclosed the park – then farmland and pastures – in 1637 with eight miles of walls (these still remain, albeit having been repaired) and kept 2,000 red and fallow deer inside. The move didn’t met with universal approval from his subjects but he did pay compensation and eventually give people a right of way and allow them to collect firewood after complaints. 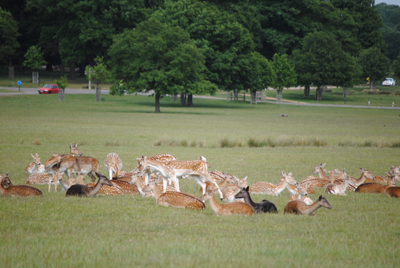 Features within the park – which still contains 650 Red and fallow deer (don’t get too close!) – include King Henry’s mound which features a protected, although tiny, view of St Paul’s Cathedral in the city 12 miles distant – it’s said by some that it was here where King Henry VIII watched for fireworks to be set off at the Tower of London indicating Anne Boleyn had been beheaded although the truth of that remains lost to history (others say it was here he watched hunting parties in the park – perhaps more likely). The park is also home to White Lodge – it was a hunting lodge built for King George I and is now The Royal Ballet Lower School (complete with ballet museum) – and Pembroke Lodge – this house with stunning views overlooking the Thames Valley, now a restaurant, was once home to Prime Minister Lord John Russell and later the childhood home of his grandson, Nobel Prize-winning philosopher and mathematician Bertrand Russell. More recently created is the Isabella Plantation – a woodland garden created largely in the 1950s by George Thomson , then park superintendent, his head gardener, Wally Milleron, an area once known as The Sleyt or Isabella Slade. The garden is well worth a visit at any time of year, having been specifically designed to be interesting all year round. Richmond Park also features a lake divided in two by a causeway – as so known as Pen Ponds – which was dug in 1746 and remains a good place to see waterbirds.